There’s no trick-or-treating in Snowville tonight. In my house, we couldn’t even enjoy our rare uncontroversial family tradition of pumpkin carving, which Mr. 70 Percent and I started long before we ever heard the splitter-splat of baby spit-up on the floor. 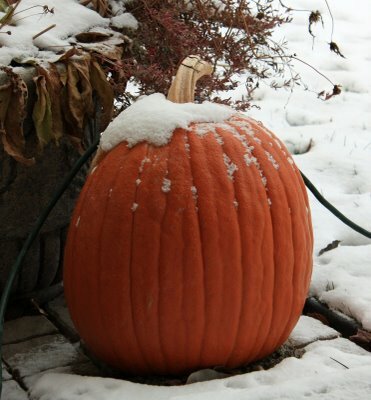 This year, our pumpkins are too frozen to get a knife through. The risk of a major laceration is high enough already given that we’d be carving them by candlelight, thanks to the great October Nor’easter of 2011 which took out our power, along with all the joy of Halloween. New Englanders, never ones to let a little autumn storm stand in the way of a good time, are proud of their unflappability. We love to complain about the weather, but it’s a bit disingenuous; no matter how miserable it gets, we’d never leave our sugar maples or stone fences or historic town greens. But 10 inches of snow and 60 mph winds two days before Halloween? The weight of the wet snow sheared giant branches off healthy trees; one local meteorologist called it “the worst October snowstorm in New England history.” And I haven’t even hauled the mittens and boots up from the basement yet. I’m not going to go all “global warming” on you. After all, I’m the one who once admitted in the pages of Newsweek that I sometimes throw peanut butter jars away instead of recycle them. But what the hell? Is this payback for those peanut butter jars? For the glorious crisp late September days we sometimes take for granted? It’s hard not to feel like the planet is completely out of whack. Meanwhile, my iPhone mocks me: Cupertino, the weather app says, above a column of suns: 75, 72, 75, oops there’s a 61. Poor, poor souls. The snow would be tolerable, perhaps, if it weren’t for the loss of Halloween. In the middle of the afternoon I started getting emails from every school and sports league in town: “Trick-or-treating has been postponed until Saturday, Nov. 5.” I acknowledge it’s impractical for small children who can’t see out of their eye-holes to go door-to-door between dark houses on unlit streets. But trick-or-treating in November? We might as well postpone New Year’s Eve until mid-January. At least we still get Halloween; my father told me that in his Connecticut town, the selectman just canceled trick-or-treating outright. It’s like the Grinch stole down the hill and snatched up all the little pumpkins and Kit Kats in Ghoulville and shoved them into his sack and took Halloween away. P.S. The power just came back on, but there’s still no Halloween. The worst part is now I can see the empty wrappers of all the Milky Ways I’ve eaten. 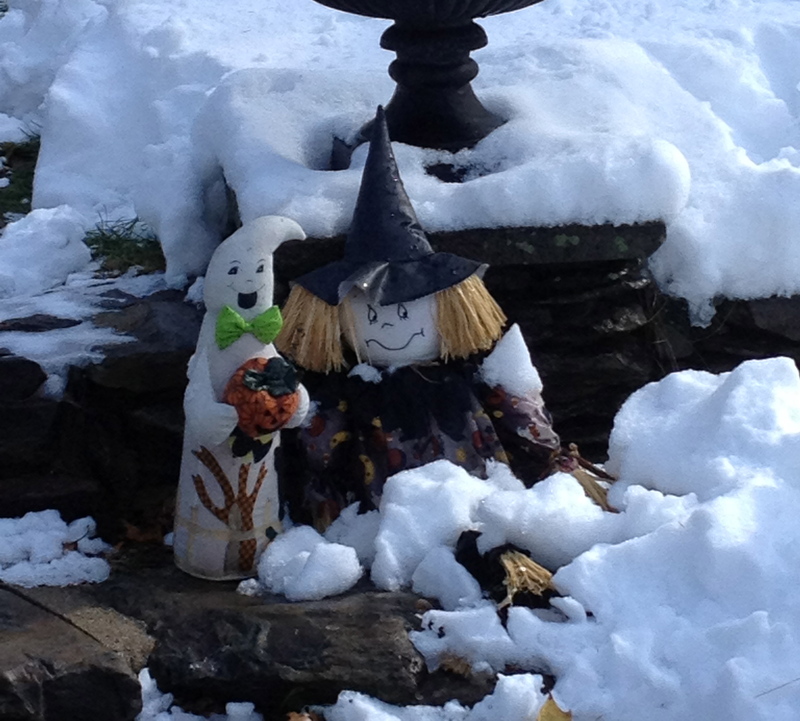 This entry was posted in Family life, Kids, Parenting and tagged Halloween, October snow, power outage, weather. Bookmark the permalink. Definitely the grinch stealing Halloween! I just fished the peanut butter jar out of the garbage…. “…the splitter-splat of baby spit-up on the floor.” Sue G. to the core. I’ve been tittering all morning. Thank you. Not enough to miss Halloween, but all the candy is on sale tonight at Summit’s CVS and Christmas trees and stockings are now lining the shelves. Glad to hear your power’s back (ours is too, but not everywhere in Summit)–it WAS a scary week!